Please note that organisations wishing to show Friends and Heroes Multi-Language DVDs in a group setting need a Public Display Licence for Series 1 for their premises or for a named presenter (even when no admission fee is charged). Friends and Heroes Series 1 by Friends and Heroes was published by Friends and Heroes in September 2015 and is our 3094th best seller. The ISBN for Friends and Heroes Series 1 is 5051347910311. The Best Kids Church Resource ever! This material is SO good. I've enjoyed following this series through as much as the children have!! Its quality media and true to Bible text, it not only tells the Bible character stories incredibly well but it gives a great picture of Jewish life too, therefore giving context. The lesson material is easy to access, fun, adaptable and quite instant, limiting the need for excessive leader preparation. The best of it is that the children in our Church have retained the knowledge of the Bible stories SO well from watching and learning and can retell the stories long after they've watched them. Got a question? No problem! Just click here to ask us about Friends and Heroes Series 1. A:I can confirm that Friends and Heroes Series 1 is All Regions. I also checked Series 2 and 3 as sets and they are also All Regions. For a specific title, please email me and I will check for you. Please note these packs do not include a Public Display Licence and make sure to check the requirements of the country where you will be viewing them. Thank you for using Q&A Forum. Previously a lifetime license and access to teaching material has been included? Is this still so? A:The publishers have made a change to the Friends and Heroes packs so we now have two options. 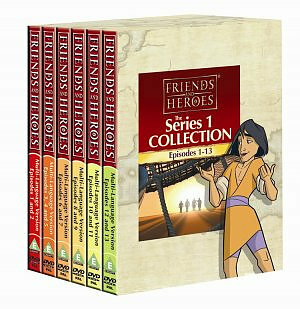 What age is this series (Friends & heroes)suitable for please? A:The Friends and Heroes Series is recommended by the publishers for children aged 6 to 10. A:The Children cartoon series Friends & Heroes has the recommended age 4-8, as given by the publisher.